To compliment our existing “Fork Fleet” we have a brand new Daf CF85 8×4 with an 8 metre tray and 13 Tonne load capacity. Moffett M5 capable of loading / unloading 2 tonnes from one side of vehicle – perfect for sites with limited access or 2.5 Tonnes when access to both sides of truck. Plus NEW Daf Prime mover Semi trailers capable of carrying 18-20 pallets spaces and 22 Tonne load capacity, also fitted with a Moffett M5 as above. As a further safety initiative the Moffetts are remotely operated for loading and unloading removing any working at heights risks. 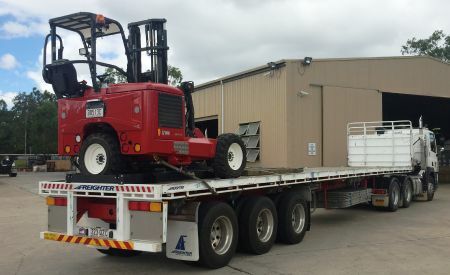 These vehicles are perfectly suited to all site deliveries and pick ups for Scaffold, Bricks & Masonry, Tiles and any other products that need to be picked up or delivered with forklifts.